From its inception in 2006, the latest reboot of the James Bond franchise has taken some unexpected steps. Daniel Craig, blonde-headed as he is, quickly proved himself as the ideal choice to bring Ian Fleming's debonair superspy to life. That part of the 007 equation has been on solid footing this whole time. The films, though, have gone to great lengths in sidestepping the expectations that come with a franchise that's now passed its 50th year in the cultural zeitgeist. Craig is Bond yet again in Spectre, and, once again, fans of the series should immediately hit the eject button on any expectations. Any preconceived notion of what Spectre should be like will do a disservice to what the filmmakers were trying to do this time around. It's not as if those filmmakers are making it easy for us to throw out our expectations, either. Sure, Spectre carries on with the story progression we've already witnessed through Casino Royale, Quantum of Solace, and Skyfall. Bond's former boss/mentor, M (Dame Judy Dench appearing here only in stock footage), has been killed. The MI6 offices have been destroyed. When Spectre begins, an agency board is deciding whether or not the Double 0 program should even continue, the agents now looked upon as fossils of an antiquated system. It's a headache Bond's current boss, the new M (Ralph Fiennes), must contend with, and it doesn't help that the organization's best agent is going off on rogue missions. Bond undertakes these unofficial missions – the thrilling, opening scene in Spectre included – is part of the deceased M's final order, a posthumous order, she has had delivered to Bond via recorded message. Not even death can stop that woman's work ethic. M's final mission leads Bond to the clues and individuals who will ultimately lead 007 to SPECTRE, a super secret organization bent on world dominance. Bond's investigation also leads him to SPECTRE's enigmatic leader Franz Oberhauser (Christoph Waltz), a very powerful man with a very personal agenda against Bond. Cue the Bond women. Basically cue all the classic, Bond trademarks that have kept us entertained all this time. There will be a large section of audience members who will be upset, disappointed, and probably frustrated with what Spectre – and the people who made it – has in store for them. Since the franchise's 2006 reboot with Craig the films have taken on a grounded sensibility, a tonally darker and more realistic vision of 007's dangerous world. There were consequences to Bond's actions and the actions of his adversaries, and, even though you know the agent would be physically safe, you also recognized the emotional darkness building within each time someone close to him was killed. After Skyfall, the grittiest and some would argue best Bond yet, you might expect this next entry to continue down that dark, foreboding path. Now is a good time to remember what I said about this series and expectations. Returning from directing duties on Skyfall is filmmaker Sam Mendes, the man who, in the late 2000s, offered up Revolutionary Road and Away We Go, two movies about relationships with extremely opposite attitudes. Both were phenomenal films, and, to get to my point, it felt as if Mendes was using one to answer for the other, Away We Go acting as a lighthearted palette cleanser after the rough Revolutionary Road. With Spectre, you notice the tonal similarities in these two groupings of films. Technically speaking, these are all gorgeous movies from Mendes. As with Skyfall, the director captures flawless imagery and beautiful composition, cinematographer Hoyte van Hoytema doing a suitable job filling legendary DP Roger Deakins' shoes. Let's be honest for a moment, nobody fills Deakins' shoes, but van Hoytema makes everything in Spectre appear beautiful enough. With locations, sets, costumes, and choreography on constant and glorious display, Mendes has no issues proving why he's in charge of the direction of this franchise. All you have to do is watch Spectre's opening minutes to notice that. Set during a Dia De Los Muertos celebration in Mexico City, Mendes' image moves through crowded streets filled with costumed and masked attendees, focuses on and follows one individual dressed in white for a bit, then follows Bond as he enters a building and proceeds to the roof where he sets up a sniper rifle ready to take out the individual in white, who is now in the building opposite Bond adjacent from his position. It's all one, continuous shot, and Mendes pulls it off effortlessly and with minimal flash. The rest of the film plays out with equally impressive skill in the technical department, but that's not this area where fans of this new slate of Bond films will be turned off. That aspect comes elsewhere. Spectre offers much to impress both casual and die-hard Bond fans. Mendes' visual capabilities in action and dialogue scenes alike; the exciting chase sequences that play throughout the film; and the solid-yet-quiet turns by Waltz and Dave Bautista as the film's supervillain/henchman duo are all classic, Bond prerequisites. Léa Seydoux and Monica Bellucci as the latest Bond women are perfect choices, Bellucci's part coming off a bit obligatory. Spectre is lighter on the gadgetry, but Q branch still makes an appearance, Ben Whishaw having taken the part on beautifully in Skyfall. 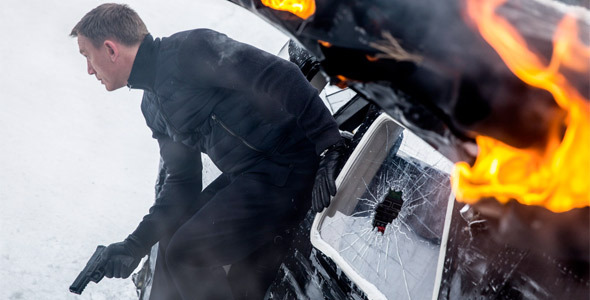 On paper it looks like Spectre has all the markings of an exceptional Bond film. Add to that the built-in desire in continuing the same story and tone as the recent films. That is where the trouble with Spectre lies - in its tone. While the previous Craig films rode the hard line of grounded realism, this latest outing is a huge step to the left. It feels more like a Roger Moore-era Bond film complete with lame quips, a storyline that is more convoluted than required, and villains who are more eccentric than proficient, at least when it comes to dealing with Bond. The villains in Spectre make obvious mistakes, mistakes that have been covered in parody films like Austin Powers. They capture Bond instead of killing him outright. They monologue to Bond instead of making sure the protagonist is neutralized. Any mystery found within the film's screenplay is easily sorted out to the point that the audience is always two or three steps ahead of the story. That aspect may have worked in the hokier years of the Bond franchise, but it just feels odd here, especially in the culminating story that follows the previous three. Certain inclusions and references in the film make it all the more obvious that this retro attitude was a conscious decision. 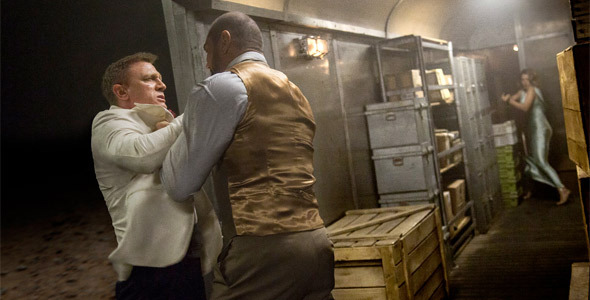 There's an awesome stunt with a helicopter during the opening, a hand-to-hand fight on board a passenger train, and Bond even donning a white tuxedo at one point. These are all markings of a certain era of Bond film, and it becomes apparent at what Mendes and company were aiming. Again, though, to make these choices at this stage in the franchise just feels odd. It also gives an impression of exhaustion and laziness, conscious decision or not. Craig's performance isn't helping with that, either. His Bond has always been a little more self-destructive than previous takes on the part, his cool only shaken when someone for which he cares is threatened. Craig's Bond would ride a missile to its point of impact if that meant completing his mission. In Spectre, though, Craig just seems tired. It could be read as the exhaustion of a spy who has been desensitized to the world around him from loss. It comes across as an actor who seems tired of the role he's playing, and the lack of intensity or even concern in his performance bleeds out into the movie, itself, to the point that there's very little, genuine suspense in the film. It was a foregone conclusion that Waltz would, at some point, play a Bond villain, and Spectre offers him the chance to play the ultimate, 007 baddie. Again, don't expect to see any Javier Bardem-levels of intensity that genuinely make you frightened of this character. Waltz's performance is more subdued at first, the atmosphere around him turning more comic bookish when he and his plan are finally revealed. On the flip-side, Seydoux is magnificent. She plays a woman under Bond's protection, but the actress gives a powerful performance that quickly places her as Bond's equal. As it is, Spectre would have been a welcome addition to the James Bond franchise 30 or 40 years ago. The unbelievable choices the characters make and unnecessary eccentricities would have fit right in with the Roger Moore films or even the later years of Sean Connery's reign. With the latest entries, the James Bond films have aimed for something greater than the mindless escapism of old. The visual style brought by Mendes and his team warrants a Bond story as grandiose and impactful as what we've seen recently. With Spectre, though, the cookie-cutter model of the James Bond films of old has returned. Love it or hate it, there's a reason for this tonal shift in the franchise. It just would have been nice of them to complete the established arc before going back to old ground. "As it is, Spectre would have been a welcome addition to the James Bond franchise 30 or 40 years ago" Awesome, based on this comment alone I may now actually go see this movie.. I never cared for the last few Craig "grounded in realism" movies. I have to say the technical aspects of the film is among the best in 2015. Story? What story? Craig barely even tried, he just phoned in the entire film. I feel really bad for Waltz and Seydoux, they were awesome. Waltz was used so poorly, I was astonished. You have Waltz as your villain and that is how you are going to utilize him?! I figure Mendes and crew felt that Waltz considerable prowess would cover any narrative short-shifting. Hmm i think you got me more interested in Spectre. I like the Roger Moore era and i realy disliked skyfall. But wasn't the long running time to much? Or was the pacing good? Pacing is actually solid. Aside from the Monica Bellucci subplot there really isn't much fat to trim, and it doesn't feel as long as it is until the extended ending. Yeah, this was kinda disappointing to read. I've been pretty much hearing the exact same complaints too, but I just don't understand why all of a sudden they decided to sellout at this point so far in, tho? I mean wasn't the whole point of casting Craig in the first damn place was for a more serious, dramatic and umm "realistic" Bond series? I'm glad they've returned to what put James Bond on the map. Skyfall is one of the most overrated movies ever. Glad to hear the Bond I grew up with has returned. This is the second time that Martin Campbell has ushered in a perfect tone for the series...and then been completely ignored by the selfish directors that follow. I hope they hire Mendes one more time - to drive the series into the ground - and then let Campbell revive it again. I can't see any problem with a black 00 agent, just not Bond, the character isn't black... or a woman.